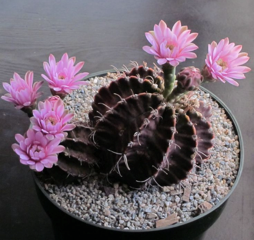 This month, the Cacti and Succulent of the Month are both miniatures. Miniatures are defined differently for different shows. 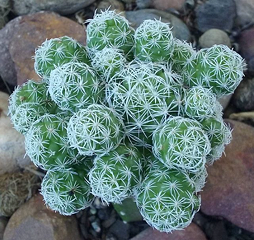 In most cases, the definition is a mature plant in a pot with an inside diameter less than three inches. 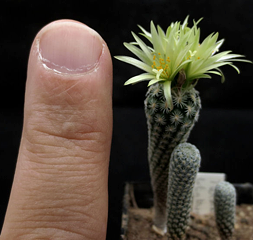 Some shows define the miniature category as any plant displayed as a miniature. This allows seedlings and young plants to be entered as miniatures. 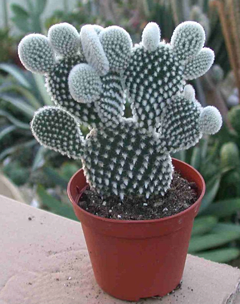 Others require the plant to be the smallest in a genus. We’ll use the broad definition for the Plant of the Month. The key to success is staging plants. 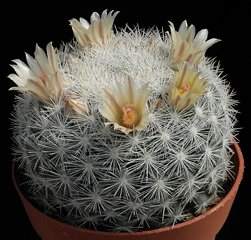 Particular attention must be paid to the relation of the plant to the pot, the top dressing, and any rocks. The importance of color, geometry, and texture are all magnified in the smaller scale of miniatures. Succulents entered as miniatures include representatives from almost every family, and a list would be far too long to print. Unusual entries often do well. With care, species that normally grow large can be kept small, stunted by the lack of root room. Even though small, miniatures need a little fertilizer to keep growth looking fresh, and frequent watering, since there is little storage either in the pot or the body of the plant. From the Greek astro (star) and phyto (plant). From the Greek gymnos (naked) and kalyx (covering; calyx); the flower buds are naked. Named for Nicolas Mihanovich, 20th century Yugoslavian shipping magnate and patron of botany. From the Greek myrios (many, countless) and stigma (thorn, point). 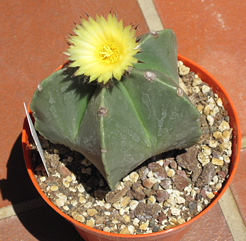 Named after Opus (Greece), an area where other cactus-like plants were grown. From the Latin turbino (spinning) and karpos (fruit).